Trad stern with very large sliding hatch. 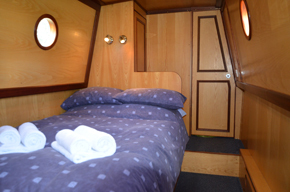 Fixed double master cabin with wardrobe and vanity unit. 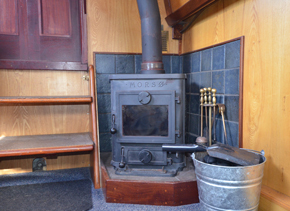 Open plan saloon with two easy chairs and solid fuel stove. Traditional stern with very large sliding hatch. 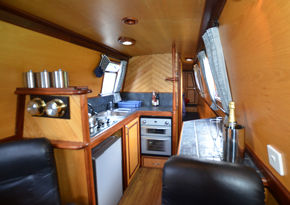 Fixed double in master cabin with wardrobe and vanity unit. Fully tiled bathroom with remote flush toilet and power shower. 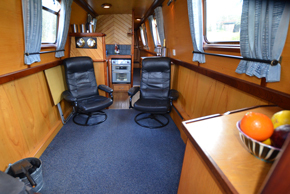 Open plan saloon with two easy chairs and solid fuel stove. Carpeted cabins. 240v electrical supply. Radio/CD player. colour TV/DVD. Vacuum cleaner. Hair-Dryer. The large shower has a high pressure shower unit and there are china, fresh-water flush toilets.